1. “The next thing I remember was hearing someone banging on the door. It was around midnight. When I woke up I was lying on the floor covered in sick, my legs wouldn’t work. I crawled over to the door and opened it. The doctor and the guards were there, they barged into the room. Marie Crowe speaks to Ian Turner about his experience of carbon monoxide poisoning in this week’s Irish Independent. 2. 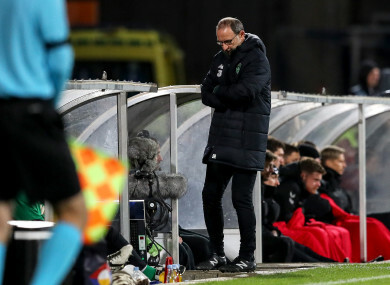 As the final whistle went at the Aviva last Thursday night you glanced up to see the home stands were already mostly empty, with what was left of the crowd rapidly draining away up the stairwells. Some 48 hours later the blast of another final whistle at the same stadium triggered a riot of ecstasy, as Ireland celebrated victory over the All Blacks. The contrast could not have been more cruel. In one sport an all-Ireland side beats the best team in the world for the second time in three attempts, while in the other, the two pieces of partitioned Ireland cannot even score against themselves. Ken Early explores the contrast in fortunes of our Irish rugby and football teams and asks where Irish football goes from here after a tumultuous week. 3. When Taylor replaced Derek Dougan as chairman of the Professional Footballers’ Association on 13 November, 1978, the other stories of the time included a strike of bakery workers that had led to bread rationing. Watership Down was at the pictures. A pint of milk cost 11p and the average annual salary was £5,440. Taylor had chestnut hair, a kipper tie and a boy-next-door look. If, without wishing to be too cruel, you lived next door to a boy who turned out to be monotone, divisive, wildly over‑remunerated and puffed up with self-importance. In fairness to the old boy, nobody could argue that, on a personal level, his professional life has not been a success when Taylor has hived off preposterously large amounts of money for himself, held a position of influence for four decades and been decorated in the 2008 New Year honours list with an OBE that I am reliably assured doesn’t stand for Other Buggers’ Efforts. The Guardian’s Daniel Taylor takes aim at PFA chief Gordon Taylor and the controversy that has surrounded his long reign. 4. That’s what we’ll miss most now he’s gone: the winding conversations, the wisdom, the knowledge, Weeshie breathing new life into old stories of Kerry football and players and linking it all together into an unending heritage. For nearly 20 years he was the compelling force that drove the Terrace Talkprogramme from a local radio show in Kerry to a nationally-known talking saloon. He won awards and acclaim. He carried his microphone wherever he went, picking up interviews on subjects far beyond sport into politics and the arts, anywhere and everywhere. But it was football that flowed forever through every particle of his life, from beginning to end. Michael Foley remembers broadcasting legend Weeshie Fogarty in the Ireland edition of The Times. 5. The UFC’s decision to produce a documentary showcasing its history with Trump highlights the peculiar relationship the promotion has with the sitting U.S. president. It is also a lesson about the influence of sportswashing in political discourse and the mutually beneficial effects it can have on both the promotion and the politician in question. The UFC’s relationship with Donald Trump dates back to 2001, shortly after ZUFFA purchased the promotion. At the time, the UFC was still striving for legitimacy and had been relegated to small venues in states like Mississippi. Trump allowed the promotion to put on UFC 30 and UFC 31 at his casino, the former of which became the first state-sanctioned UFC event held in New Jersey, while the latter was the first UFC event held under the new Unified Rules of Mixed Martial Arts. Trump’s decision to do business with the UFC seemingly helped the promotion reestablish legitimacy. By late 2001, the UFC began hosting events in Las Vegas, which would eventually become the promotion’s home base. Karim Zidan delves into the relationship between the White House and the UFC and the organisations documentary on the sitting president of the United States for Bloody Elbow. 6. Little hills, the kind that leave you not just short but downright desperate for air, like a punch to the solar plexus. Long hills, the kind that light a fire all over your body, slow-roasting your lungs and arms and legs, sending your thoughts to a deep, dark place. I thought of Eliud Kipchoge, how the marathon world record holder smiles in races when the pain is at its peak. It’s a piece of psychological trickery that sends a positive message to his body. I tried to do the same, which lasted about three seconds before I crawled back down a well of hate. It was the crowd who pulled me out: Men and women clapping and cheering by the side of the road, rousing fading runners from their fatigue. Cathal Dennehy shares his experience of taking part in the Great Ethiopian Run for Runners World. 7. It was revealed this week that side-bets between the players, running heavily into six figures, will also be in play. Unlike the prize fund, this at least is the competitors’ own money. The imminent American explosion in sports gambling is an important subplot as, indeed, is whether two of the game’s biggest names should be so publicly advocating an occasionally problematic concept. Golf should be careful, given in theory it was wide open to betting manipulation even before legislation began to break down on the other side of the Atlantic. Mickelson’s penchant for a bet is legendary; his role in the Billy Walters inside-trading scandal such that he, too, should be treading warily. Ewan Murray expresses his disgust at Tiger Woods and Phil Mickelson’s bet-laden exhibition match this week at Shallow Creek for the Guardian. 8. In South America, he is mostly seen as the great romantic hero, the “Jugador del Pueblo” – player of the people. In Europe, he is widely seen as an embodiment of everything wrong with the game, and a symbol of its greed. Those who know him, like former teammate Nicolas Burdisso, would say the European perception is really the problem of other people capitalising on Tevez’s “hunger”. It is a hunger that has already brought one Champions League, one Libertadores, eight league titles at five clubs across four different countries as well as another seven major trophies. He is the second most decorated Argentine player ever after Leo Messi, and one of very few players in general to have won both the Libertadores and Champions League. Miguel Delaney examines the career of former Man Utd and Man City forward Carlos Tevez as he closes in on another Copa Libertadores final. 9. Jerry Perenchio was in a suite at the Dorchester Hotel in London when he got a phone call from an old pal in Chicago telling him the rights for the world heavyweight title bout between Joe Frazier and Muhammad Ali were still available. He took out his pencil, did a few simple sums, and called back with an offer of a guaranteed $5m purse to be shared equally between both fighters. He had never promoted a boxing match before, had never even seen Frazier in the ring, but figured something that would be justifiably billed “The Fight of the Century” warranted that sort of money. Dave Hannigan reflects on ‘The Fight of the Century and the brains behind Muhammad Ali and Joe Fraizer’s 15 round battle at Madison Square Garden in the Irish Times. Email “Irish football's new lows, remembering Weeshie and the week's best sportswriting”. Feedback on “Irish football's new lows, remembering Weeshie and the week's best sportswriting”.